What an awesome way to go into the break . 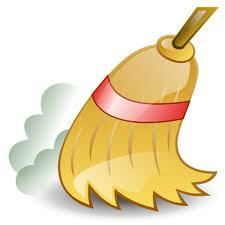 . .
With the first series sweep of the season!!! Interesting note from Rick as the top of the 9th ensued . . .
Kuma got off to a great start . . .
only SEVEN pitches to get THREE outs in the 1st and was generally efficient until the 6th when the Halos loaded the bases via a single, a double and an IBB and then scored TWO on Callaspo’s single. He ended on a good note as well, going 1-2-3 in the 7th including an inning ending K of Trout. So, Kuma goes off to the ASG having more or less returned to All Star form . . . The streak goes on . . . There they go manufacturing again . . .
And, of course Rauuuuuuul contributed . . . Some nice plays all ’round in this one, including . 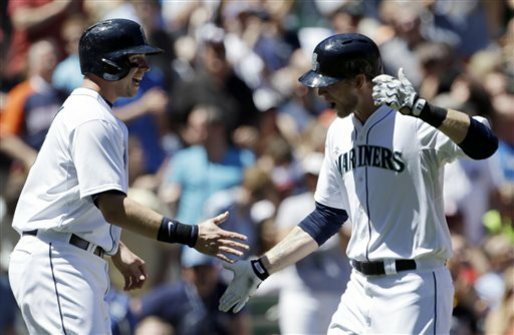 . .
With yesterday's, 6-0 win, #Mariners have tied a club record with 10 shutouts prior to the #ASG. Also done in 2002 and 2003. 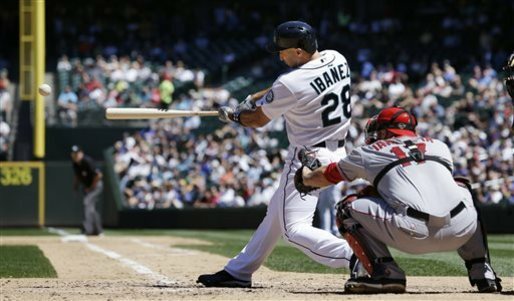 This entry was posted in GameDay, HOME and tagged Franklin, Ibanez, Iwakuma, LAA, Saunders, Seager, Smoak, Zunino. Bookmark the permalink.